View More In Jewelry Rolls. 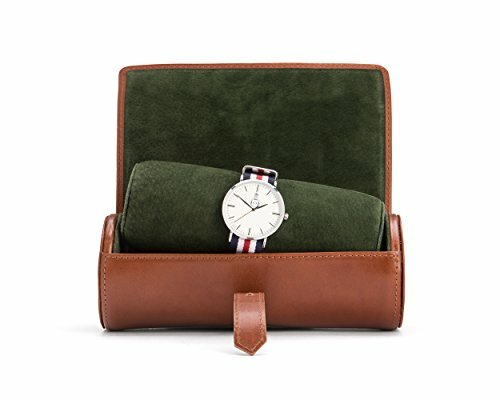 Protect your favourite watches in this stylish compact watch case with removable contrast suede padded roll to accommodate 2 or 3 watches. The tubular design means that it can fit neatly into your luggage and stays secure with a strap and buckle fastening.This ideal travel companion is handmade in the finest calf hide with a silver buckle. L: 19.5cm/ 7.75", H: 7.5cm/ 3", D: 7.5cm/ 3"
If you have any questions about this product by Sage Brown, contact us by completing and submitting the form below. If you are looking for a specif part number, please include it with your message.